We started our ascent at 5pm in the evening. This is actually considered early. The goal of climbing Mt. Fuji is to arrive in time to see the sunrise. There is even a special word for this in Japanese: raikou (lit. 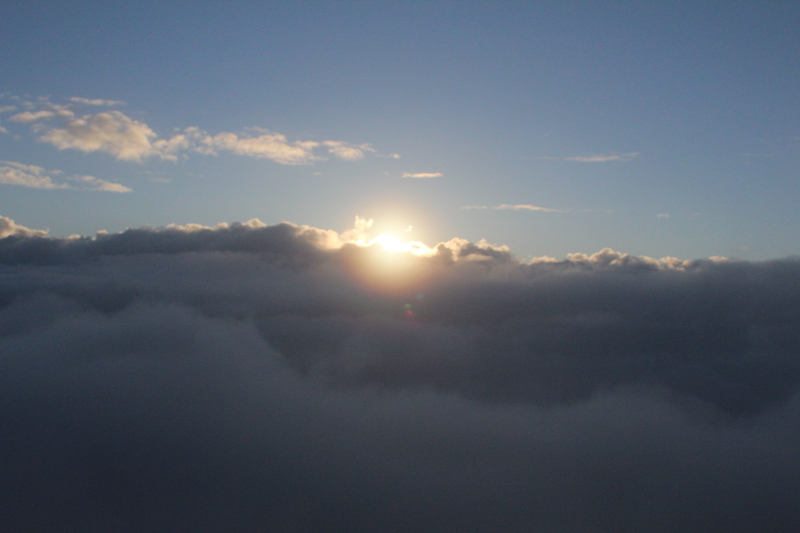 the sunrise viewed from the top of a high mountain). Most start around 8pm, causing the route to become very crowded very quickly. We decided to try beating the crowds, which ended up working perfectly. At the start, the sun was up and we were feeling really genki (lively). While climbing, we joked, sang, and took lots of pictures. While ascending, there are stations to rest at. Most people start at the fifth station, so we started there. The sun was just setting as we reached the 6th station around 8pm. The rest of the ascent would be in the dark of night. We came prepared with headlamps and snacks for the journey. Into the darkness we climbed. As the eve wore on, the climb became increasingly more vertical and challenging. I didn’t feel the affects of altitude sickness, but unfortunately Kris began to feel nauseous and light-headed. As we reached the 8th station around 11pm, everyone began feeling rather tired. I even caved and bought a hot chocolate for 400yen. Up until this point, the road was mostly deserted, with only a few climbers here and there. 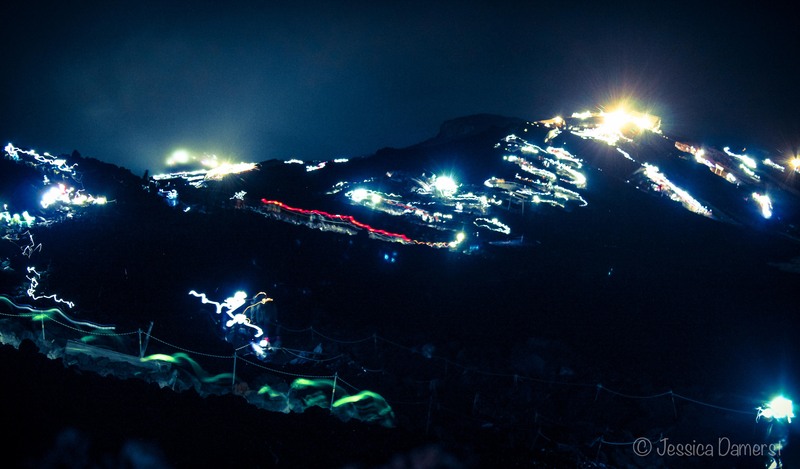 As we got higher on the slopes of Fuji, we started to see the lights of the crowds below. 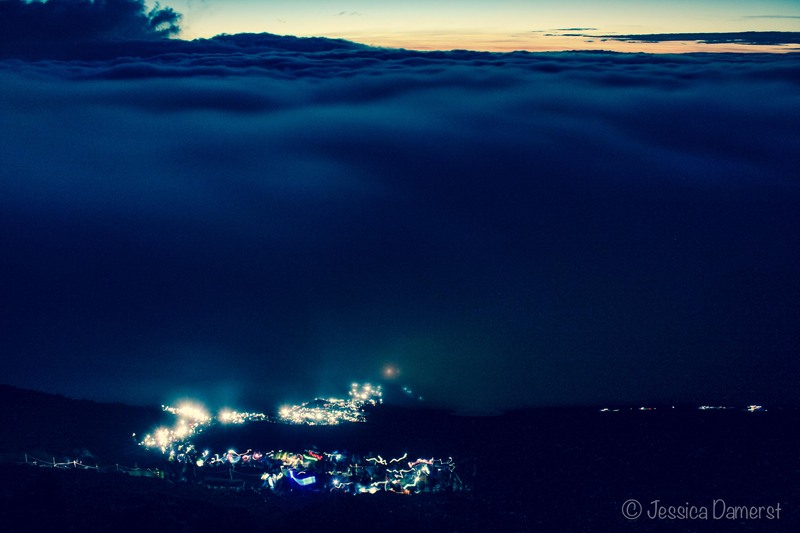 There were thousands illuminating the low cloud-cover on the mountainside. The trail of people was almost startling and made me feel the urge to rush up the mountain so they didn’t overcome me and take my prime spot at the top. At the same time, the view was absolutely incredible. I can’t explain it. It was the middle of the night, and I could barely see anything, but the feeling was unlike anything I’ve ever experienced before. As the light from my headlamp swept around the surrounding area, the local flora would light up silver with morning dew. The slopes were rocky and treacherous. I instantly felt like Frodo attempting to climb the rocky sides of Mt. Doom as battle raged on below, and thousands of undisturbed stars hung above my head. I must reach the top! Adding to the ominous mood, the old eighth station had collapsed. Due to an earthquake or something else, we didn’t know. However, it definitely added to our sense of urgency to reach the top that seemed to constantly loom ahead of us, stretching closer to the stars, and farther from us by the minute. At around 1am, we finally reached the top. It was void of life, save for about 5 people huddled in giant sleeping bags. The temperature was near freezing and we knew it was going to be a long 3 hour wait. Mind you, I’m from Florida. For about 45 minutes, I was really into taking pictures and didn’t even notice the cold. Then, it started to set in. That biting, aching cold. I finally realized how unprepared I was. While waiting, the trail of thousands of lights slowly snaked it’s way up the mountain. Their pace was slow and steady, but soon enough, the hordes of people arrived. We were so relieved to have arrived early to procure a good spot. 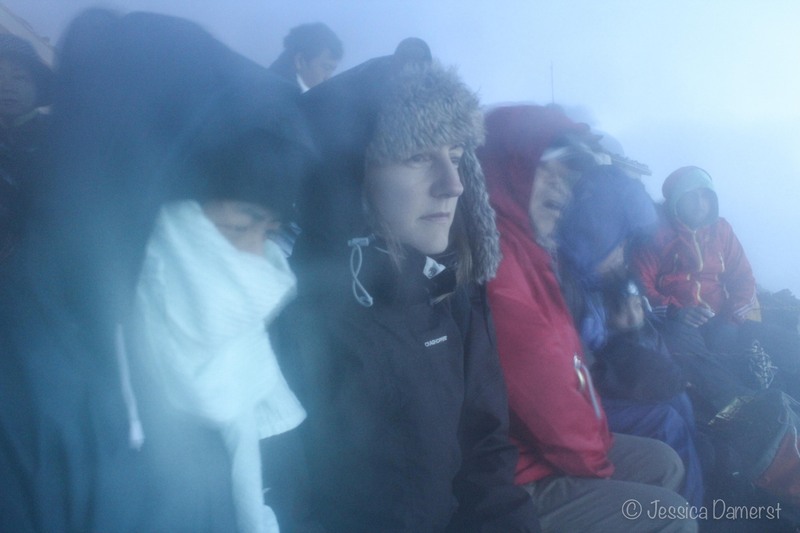 As the top crowded with people anxiously awaiting the sunrise, the cold and altitude seemed to get to us more. I couldn’t stop shivering and apparently my lips began to turn a peculiar shade of blue. Finally, at about 4am, the sun rose. It was a really cloudy day, but with a little bit of patience, we saw it. That moment when the sun became visible, everyone shouted and whooped in delight. For many, this is a religious pilgrimage as it’s the same route that the monks of old used. Most Japanese have attempted Fuji at least once in their life. We stayed just long enough to admire the sun, take a few pictures, and pay 700yen for a cup of instant curry flavored ramen. After that, time for the decent. Aside from laying under the stars at the top of Fuji (while simultaneously freezing), the descent was my other favorite part. Imagine skiing with your feet. Yup, that’s how it’s done. Of course it was raining that day, so it was a bit muddy. We would make large leaps with one foot, which would slide a few feet, and we’d leap again with the other. Rinse and repeat. Using this method, the descent took only 3 hours. The foreigners are my group. The others just jumped in for the photo! So random! 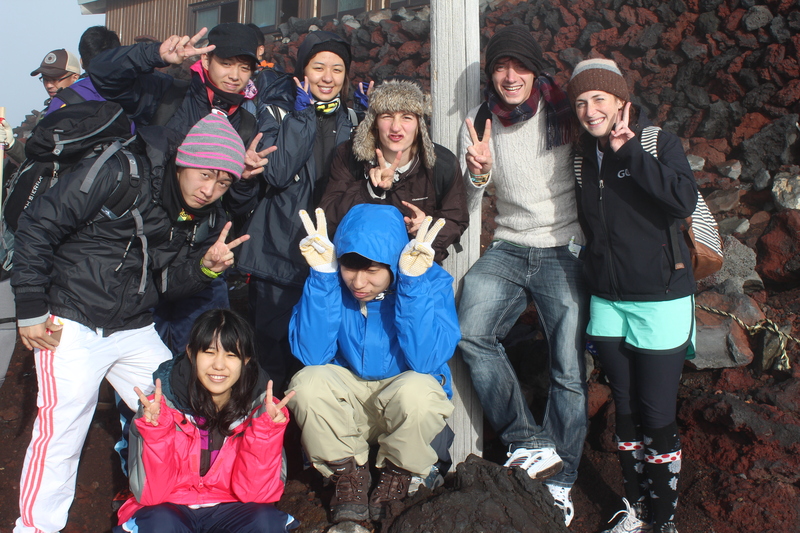 Climbing Fuji was definitely one of the most difficult things I’ve done to date, but I loved every second of it. Soon, I hope to return and try climbing from the 1st station, which is said to take 20 hours. I’m convinced I can do it! Of course, next time, I’ll remember to bring warmer close and the One Ring to throw into the crater. As I read this post I felt like I was climbing alongside you. And what a spectacle!